This idea has been in my head for quite a while now. 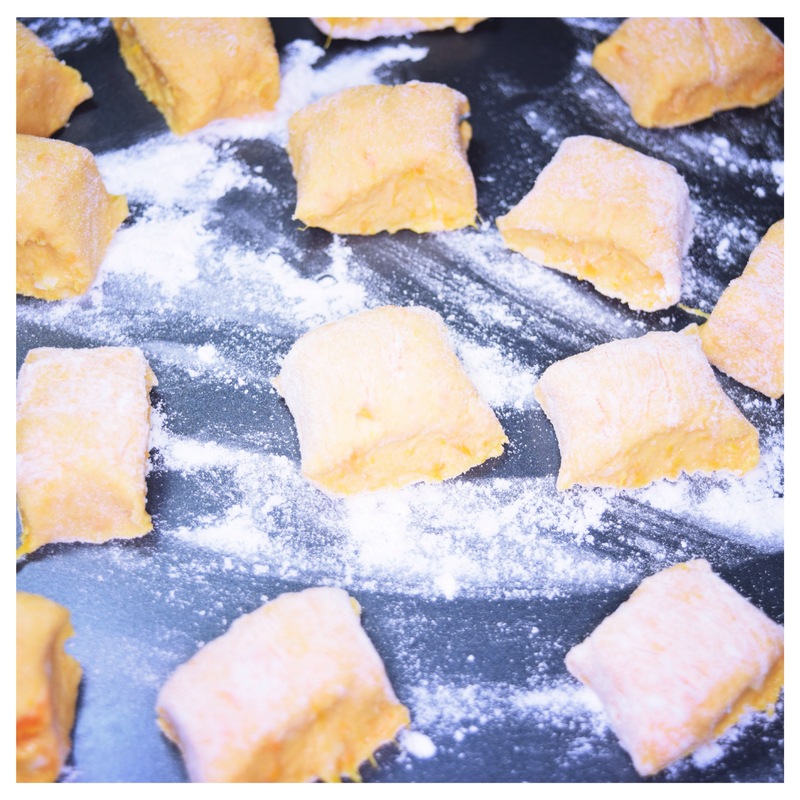 I am a huge fan of potato gnocchi and thanks to my Italian friend I have learned how to make them few years ago. I am also a great lover of sweet potatoes so I thought why not to combine 2 of them together to create a delicious dish. The biggest challenge is the sweet potato itself. The potatoes for gnocchi should be as floury as possible so you don’t have to add too much flour. Unfortunately sweet potato does not have as much starch as his less exotic cousins but I have found a solution to that. Just so the dough bonds a little faster and becomes a little lighter I am adding some corn flour but if you have potato starch it will also do the same trick. Another addition is soft goat’s cheese it is a very important ingredient for two reasons. It really changes the texture of the dumpling adding extra lightness and what is more goats cheese is quite salty so it makes a great flavour addition too. Last but not least important is the choice of what are the little goodies being served with. I have tried many variations like cheese sauce, butternut squash with grapes and pine nuts or simply tomato sauce. My ultimate favourite is crispy diced pancetta with fresh sage and Parmesan shavings. It is absolutely fantastic combination and I really recommend it to everyone if you haven’t tried it yet. 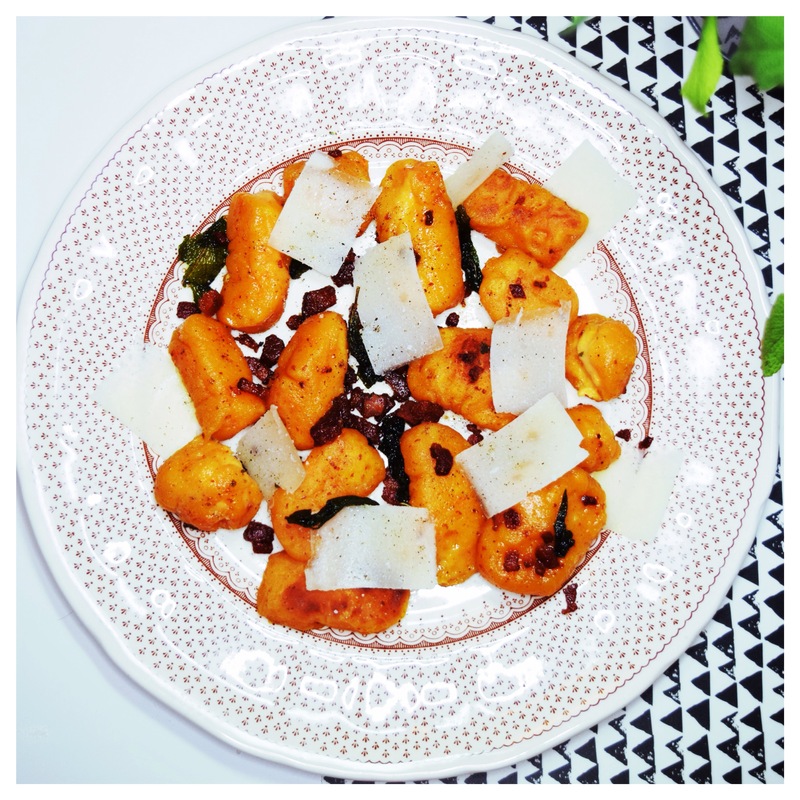 The contrast of salty pancetta and Parmesan with pungent taste of sage against the distinctive sweet potato taste of the gnocchi is just perfect! 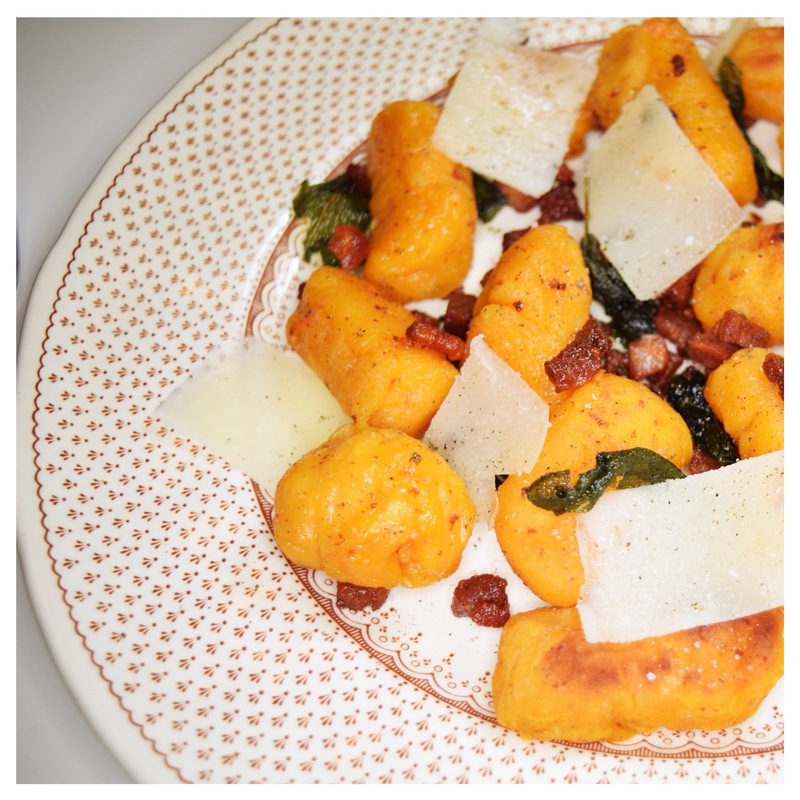 When it comes to textures it is also very complex experience for the tastebuds as you get very crunchy pancetta with lightly crispy gnocchi that are soft in the middle. 1. Preheat the oven to 200C. Wash and pierce the sweet potato with fork and brush with olive oil. Bake in the oven for about 40 minutes until soft. 2. Peel the potato and move its flesh to a large mixing bowl. Shred carefully with fork or press through the mouli. Alternately you can also use a hand blender. 3. Add the goats cheese and mix together. Slowly add a spoon of plain flour and a spoon of corn flour and start mixing together with your hand.Keep adding flour until the dough holds together and is not too sticky. It requires some patience but remember not to work it for too long as it will only become bouncier and chewier. 4. Divide the dough into 3 pieces and form them into long sausages then cut a thumbnail size pieces and place on a lightly floured tray. 5. Lightly flour your hands and form each piece of dough into a ball. Roll each ball over a floured fork. ( I know it sounds complicated so I made you this video below). 6. Heat some olive oil on a large non stick pan (I like to use my wok) and add pancetta, fry until it starts getting crispy on the edges then add the sage and fry for 20 seconds. Carefully add gnocchi. Let them cook for about 1 minute before you toss the pan and keep repeating until you see they start to crisp up on each side. 7. Move to the serving dish and add Parmesan shavings. This looks amazing! 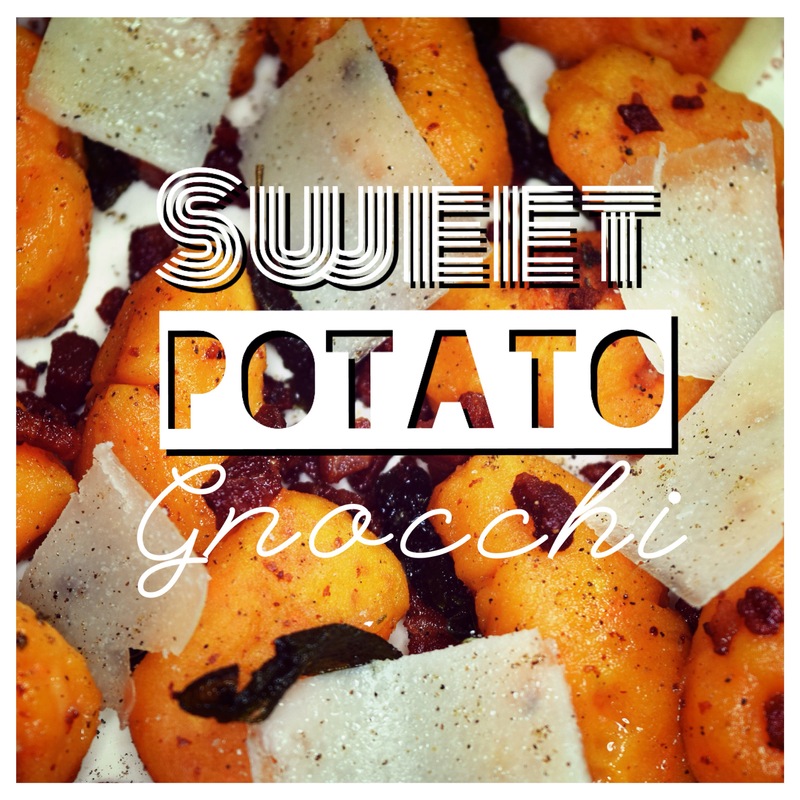 Love the idea of using sweet potatoes. 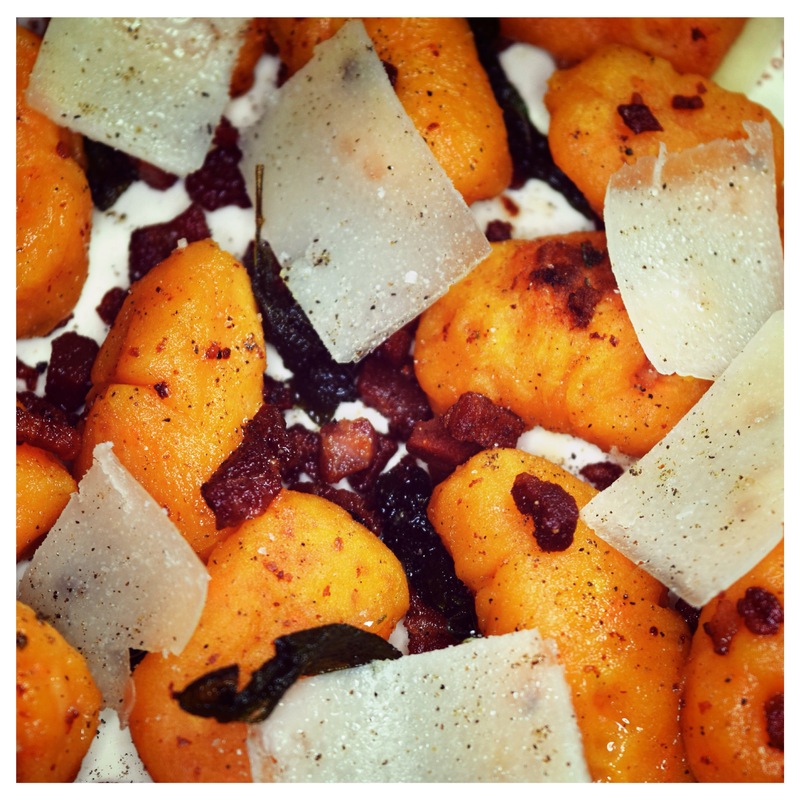 Great combination, I very much like the idea of feet potato gnocchi with bacon and sage, must try! I’ve never made sweet potatoes ones but I’ve made some with potatoes flakes (as for puree) and pumpkin (I baked thd pulp of the pumpkin in oven first). I adjusted the quantities to the humidity of the dough. The potatoes flakes probably could be used in your recipe as well. Just had dinner, but OMG these look delicious!! I will definitely try them!! Thanks for sharing! Ooo what a cool trick!